I just received the accuquilt go for Christmas and have the dwr die on the way. I have the fabric picked for the quilt (I am doing solid arcs instead of scrap pieces) but I have NO IDEA how much to get for a queen size quilt! Can anyone help? Here is the link to the wall hanging. You could figure in multiples from this. There usually is a fabric chart and pattern on the die package. I really like my accucut for strips and other geometric shapes, but i LOVE it for curved pieces!!! Please post a picture of your quilt when it's done. the patterns normally will have fabric requirements and construction tips. A lot of fabric. I did all small pieces . The patterns I used all had information some where as to amounts for different amounts look over patterns. This is part of mine. This is a ninth of my quilt as I divided it into 9sections with 9 circles in each and after joining a 9circles and sandwiches and quilted then joined. Sorry no photos taken of more pieces. In too big a rush to finish. It went over a double bed usually largest in UK. . I have a book for the DWR with solid arcs. 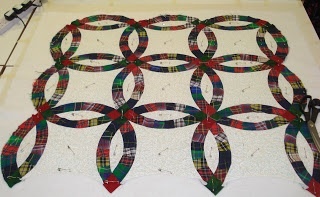 The measurements for the quilt are 89x100. The yardage needed for the center and melon shapes is 8 yards. The connecting corners 3 yards and the arcs 5 1/2 yards. The backing needs 8 yards. I hope this gives you some ideas of the amount of fabric needed.